IRVINE, CA--(Marketwire - Nov 6, 2012) - Project management software provider, Project Insight, announces the release of version 10. Project Insight is project management software that helps experienced project managers and team members of all levels to collaborate and manage projects more efficiently. The software upgrade includes a major update to the user interface, including a complete overhaul to HTML5, which makes the application even simpler to use and update from mobile devices. Version 10 presents an updated look and feel with new icons, rounded corners and gradient colors. For easier viewing, team members may optionally increase the font size. A cleaner and more simplified look can be achieved by the added ability to collapse sections of information within various forms of the project software. The underlying display technology has been upgraded from HTML4 to HTML5 and CSS3. This provides team members with better interface feedback such as highlighting tabs or lines indicating where the user's mouse is hovering. Another benefit from upgrading the HTML5 is an enhanced user experience when on a mobile device or tablet. The use of scalable vector graphics (SVG) has been implemented, which allows mobile devices to zoom into icons or images without losing any clarity of image. Project Insight, project and portfolio management software, is powerful for project managers, easy for everyone. Project Insight offers a SaaS edition as well as an on-premise edition. Project Insight's software supports The Project Management Institute, Inc.'s (PMI) standards, and is compliant with the PMBOK® Guide. Project Insight and Metafuse are registered trademarks of Metafuse, Inc. Other brands are registered trademarks of their respective owners. 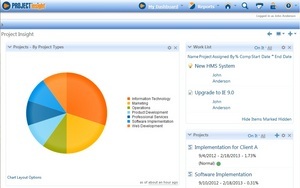 Project dashboard in project management software, Project Insight.